If you’ve even a passing interest in technology or gaming it’s pretty much impossible to not stumble over someone hyping the release of Microsoft’s DirectX 12 on the PC. But things have been quieter on the Xbox One front, particularly after the cancellation of Fable Legends, the first title touted to use DX12 on the X1. Surprisingly, EA DICE have already released a game on the Xbox One which uses the new gaming API: Star Wars Battlefront. During the Game Developers conference in San Francisco, Jason Ronald presented a programming session on the “Future of Game Development on Windows.” Ronald’s, who is Microsoft’s principal group program manager revealed the bombshell that Star Wars Battlefront was indeed utilizing DirectX 12. 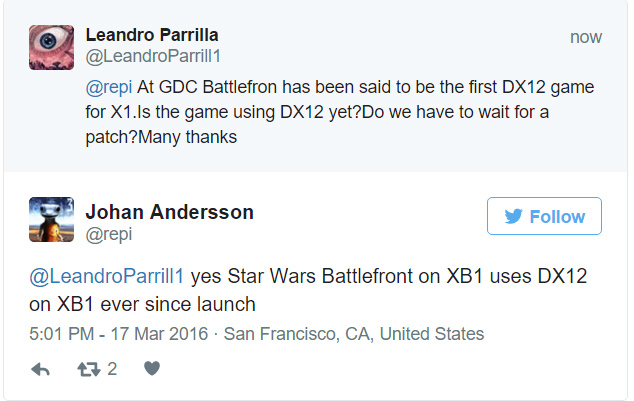 This announcement caused a lot of confusion, but was then confirmed by Johan Andersson via Twitter: “Yes Star Wars Battlefront on XB1 uses DX12 on XB1 ever since Launch,” he replied to a user. 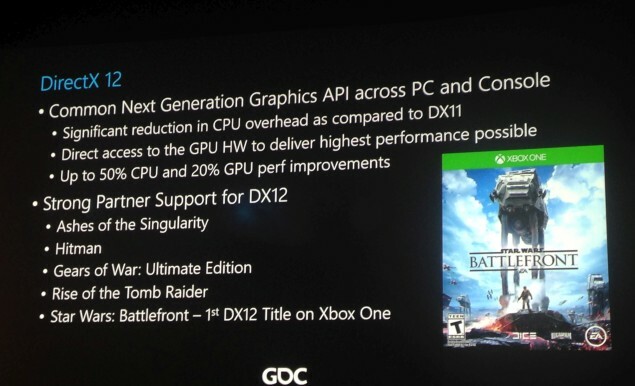 Johan Anderson from Dice confirms the Xbox One is already running the first DirectX 12 titles. It’s been long known the FrostBite 3 engine supports DirectX 12, and indeed DICE themselves were instrumental in the support of Low Level API’s since the original announcement of AMD’s Mantle initiative. With DX12 releases already trickling out on the PC, including Hitman and the patched Rise of the Tomb Raider (to name but a few) it’s interesting to ponder the possibility other Xbox One games could actually be using the latest iteration of the API rather than the old DX11 variant. This does highlight an important lesson to both gamer’s and tech-heads though – a lot of the time, you won’t know when an update makes a major change to a consoles back end. 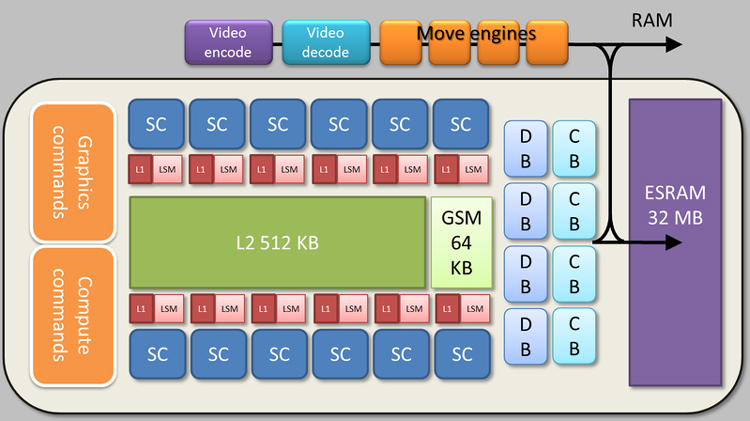 Other examples include the 7th CPU core of the Xbox One being unlocked, or even the change over to completely different (and more efficient) graphics drivers either. With news that XB1 port of Star Wars Battlefront supports DirectX 12, it also raises the possibility we’ll see DICE update the PC version too. Since we know that the engine does support DX12, there’s a distinct possibility DICE might decide to take the plunge. The very same slide presented at the “Future of Game Development on Windows” GDC 2016 also pointed to other (well known by now) benefits of DX12 – but mostly focused on the PC platform. Highlights include significant reduction in CPU overhead compared to DX11 and large GPU performance boosts. Unfortunately, PC to console comparisons are a little difficult to make, because the Xbox One’s variant of DX11 was quite different to that of the PC. Microsoft had cut away at lot of the DX11 features which weren’t necessary for the Xbox (since the hardware configurations are fixed, there’s not a need for such heavy abstraction layers) and therefore there’s little doubt the “potential boost” of the Xbox One DX12 update is less than that of the PC. The Xbox One version of DirectX 11.x is known as the Monolithic Direct3d Runtime, which improved functionality such as the ability to leverage the Xbox One’s Asynchronous Compute Engines. What the difference in actual real numbers remains to be seen, and unless a developer releases CPU / GPU utilization graphs or their own performance comparisons showing how DX11 vs DX12 on the Xbox One specifically function, we can only speculation as to the real difference. It’s fair to say though, it will likely depend upon the game being developed, the engine and levels of optimization a developer is willing to put into their title specifically. This article was filed under Articles, Features, Xbox News. Tagged with dice, DirectX 12, DX12, game development, gpu, hardware, johan anderson, xbox one dx12.